Happy to announce we'll be at Gamescom next week and PAX west in a few weeks. 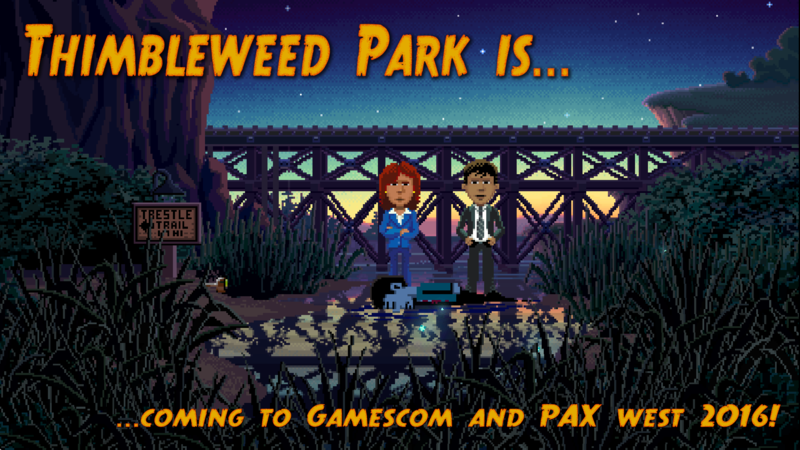 The Thimbleweed Park demo will be fully playable at both events. At Gamescom, Thimbleweed Park will be showing in the Microsoft consumer booth (hall 8) on the Xbox One. Our lead tester, Robert Megone, will be there to help and answer any questions you have about the game, like: "Rob? Are you worried about the game being too awesome?" Microsoft inviting us to show Thimbleweed Park in their booth shows a lot of support for the game. At PAX, Thimbleweed Park will be shown on PC and will have multiple stations for pointing and clicking. As PAX gets closer, we'll have more information. OK, back to the salt mines. Kickstarter backers demanded more salt. Does the demo build include voice acting? No. We won't go into the studio until the is full text lock. I hope you can make it to PAX Australia too! I will be at PAX AUS, but we're not showing the game, at least not formally. We'll let you know as it gets closer. Will there be a public demo build at some point? Also, the demo versions to older games such as Indiana Jones 4 and Monkey Island -- what were they originally for, and when were they released publicly? No, there won't be a public demo. Robert is probably worried about that! Really looking forward to the demo and meeting Rob! Caren and the Tangled Tentacles is so amazing! Just what I needed to keep me sane while waiting for Thimbleweed. Pardon me for the question, will Robert Megone be at GamesCon all the days ( August 18th - 21st) or not? Thank you, I'm organizing my travel, maybe I'll pay a visit on Saturday and Sunday. Hey Ron, I am contemplating visiting cologne, to show up at the Adventure Treff Party. Will you be there as well? Wait a minute! You're just taking vacations, and using the conventions as your cover! I like this new blog post rate. Keeps me awake. I WONNA PLAAY THE GGAAAAMMEEEEEE! it's kinda difficult for me to come, but, who knows. Will you be at gamescom, Sir? I will not be there, but Robert will be. Nice, I'm looking forward to get my hands on the game at Gamescom! My first ever visit to Seattle (from UK) coincides with PAX West, but tickets sold out so quickly and I was gutted :( I really wanted to go as anticipated TP would be there. Maybe I'll try and peer through a window or something. I was a Gamescom. So sad the game was in a 18+ area. As I was with my son, i did not had chance to try it ! But i can't wait to be early 2017 to have it !